If I had to sum up my favorite style of food it would be rice with goop on top. I know that isn’t an appetizing way of putting it. But think about it, rice with goop on top encompasses thai curries, indian food, lots of middle eastern dishes, beans with rice… Basically some of the best spicy & saucy dishes of the world come in the form of rice with goop on top. That being said, I don’t really know how to make many of these dishes. I’m a southern girl and I was raised on collards, fried chicken, and pulled pork. My mom made lots of spaghetti and cooked lots of vegetables but family dinners never strayed far from our southern roots. It wasn’t until I moved to the Bay Area a few years ago that I was even introduced to many of the ethnic foods that make the Bay Area food scene rock so hard. Lately, I’ve been trying to incorporate some of these dishes into my small but growing repertoire of culinary know-how. On a typical San Francisco summer night last week, typical being cold and foggy, I wanted something warm and spicy for dinner. I wanted rice with goop on top. I wanted some indian food. 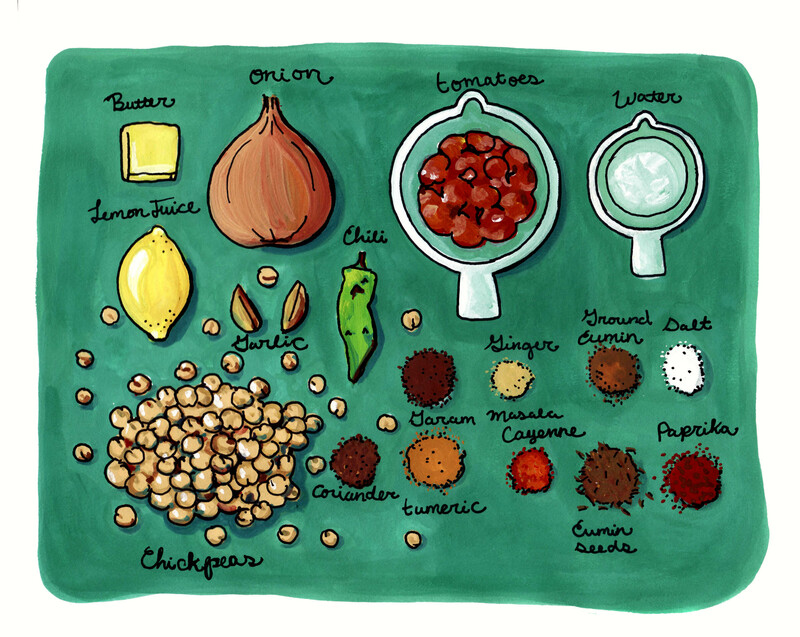 I found a good looking recipe for Chana Masala on Smitten Kitchen and to my delight it turned out to be simple to make. I put my sweetie on vegetable chopping duty and I got together the necessary spices and it quickly came together. Best of all, it was damn good. I changed my recipe a little from the one on Smitten Kitchen, the main difference was that I used butter instead of oil, ginger powder instead of fresh ginger, and a little more salt. Step one: Prepare all of your vegetables. Mince the onion, Chop the garlic, and chili pepper and get your tomatoes ready to go. Once everything is chopped and prepped, get your spices together. 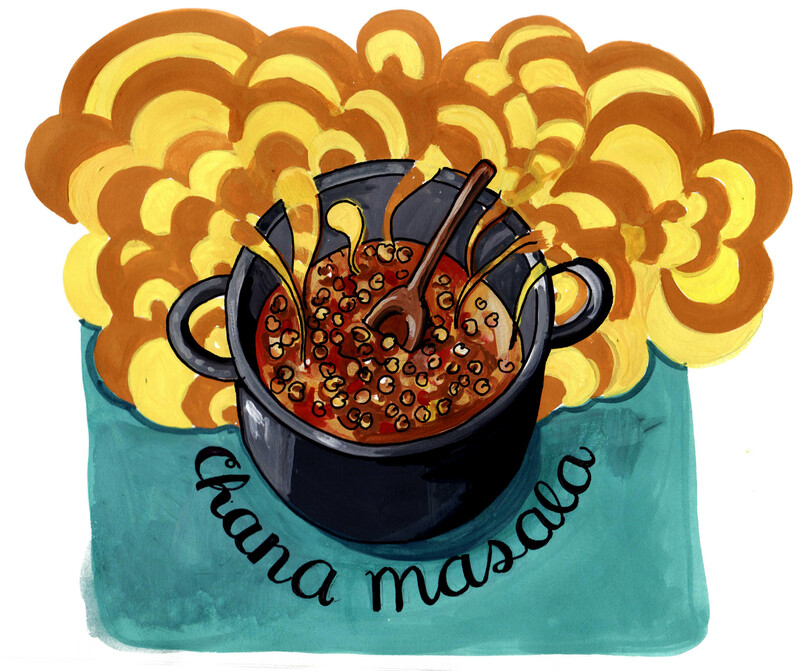 Gather the coriander, cumin, cayenne, turmeric, cumin seeds, ginger powder, paprika and garam masala into a small cup or bowl. Prepping everything before hand makes cooking much easier and cuts down the probability that you’ll accidentally leave a spice out. Step two: Melt the butter in a large pot over medium heat and cook the onion and garlic for 5 minutes. Step three: Turn the heat down to medium low and add the spices. Step four: Cook the spiced onions for two minutes, then add the tomatoes, chickpeas and water. Step five: Simmer uncovered for 10-15 minutes. Then add the lemon juice and salt. made it last night and it was soooo good. You guyshave to try this.